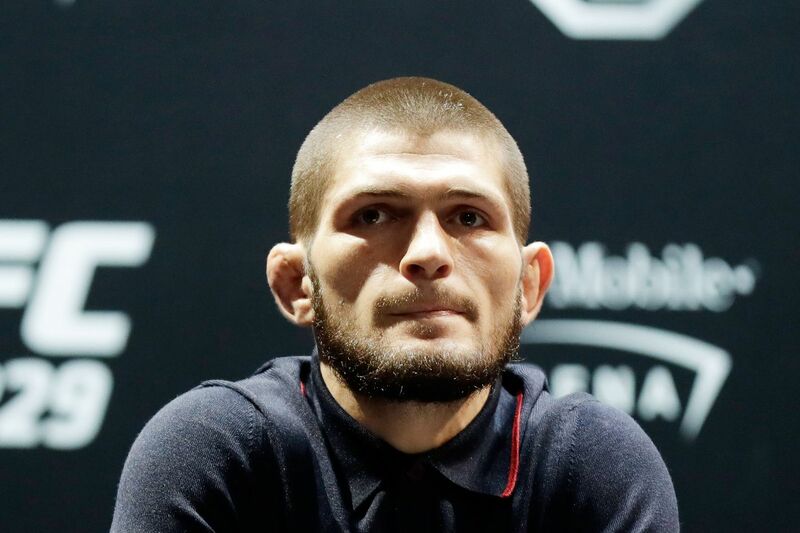 UFC lightweight champion Khabib Nurmagomedov was asked if he had advice for female fighters. The Dagestani took his time before giving his response. Be a fighter inside your home. The audience erupted into cheers. Khabib continued. All the time, finish your husband. [more cheers] smash him really bad. This is far from the first time a male mixed martial arts champion has expressed regressive views regarding the role of women in the sport. George St. Pierre earned the ire of female mixed martial artists a few years ago by expressing his admittedly ‘traditional’ views about women and cage fighting. Khabib’s compatriot Fedor Emelianenko is also on record disapproving of female fighters in mixed martial arts (though, oddly enough, boxing or wrestling are fine). This also isn’t Khabib’s first brush with controversy. He advised his countrymen in an Instagram post about the immorality of rap music, he has endorsed criminal Russian oligarchs, and of course he ignited a post-fight brawl with Conor McGregor’s teammates. UFC PR evidently told MMA media to refrain from any questions about Greg Hardy’s past, and MMA media complied. No one told the UFC to sign Greg Hardy, who according to evidence and sworn testimony has a record of domestic violence (his conviction was overturned on appeal and expunged after he settled with the victim), and certainly no one told them to book him on the same card as very recent domestic violence survivor Rachael Ostovich. The UFC will look to move Henry Cejudo vs. TJ Dillashaw to main event their January ESPN card in Brooklyn. John Lineker shouldn’t be able to beat Dominick Cruz, but his power and aggression means the fight will be Cruz dancing on a knife edge. This is why people don’t like PETA. PETA wants to stop SPECIESISM by eliminating anti-animal language. Speaking of animals, the Russians sent their cosmonauts into space with pistols: three-barreled pistols with a machete attachment. It makes sense once you realize that the pistols were for bear. Luke Rockhold and Michael Bisping continue to build toward a possible trilogy fight with their social media feud. Five fighters from UFC Fight Night 113 are facing potentially lengthy medical suspensions. Deron Williams has a unique perspective on the possibility of a UFC fighters union. Williams, who plays for the Cleveland Cavaliers, is a member and major proponent of the NBA Players Association (NBAPA). He’s also a longtime UFC fan. And now he’s closer than ever to the sport of mixed martial arts as the co-owner of Fortis MMA in Dallas. In viewing the fighters who train at his gym, Williams sees what he describes as a a high-risk-and-low-reward situation. He sees fighters who are “putting in a lot of work — blood, sweat and tears — for very little money,” Williams told Ariel Helwani on Monday’s edition of The MMA Hour. Recent attempts to start a fighters union have been futile and associations have had a hard time gaining a foothold as well. The MMA Fighters Association (MMAFA), which has been around since 2008, has had the most success, spearheading an antitrust lawsuit against the UFC that is currently in litigation. Talk of some kind of organization of fighters hit a fever pitch when the Fertitta brothers sold the UFC to WME-IMG for more than $ 4 billion last summer, but have cooled down since then. While NBA players see an increase in salaries when the league signs a new broadcast deal — as mandated by the collective-bargaining agreement with the NBAPA — UFC fighters don’t get a percentage of the promotion’s broadcast money. And that money is likely to expand exponentially when the UFC’s deal with Fox is up next year. Williams has been a fan of the UFC for years and has been training in MMA himself, too. Williams said he has trained on and off for about four years, but has really gotten into it in the last 18 months, especially Brazilian jiu-jitsu. He trains with his coach and partner Sayif Saud at Fortis MMA, with Rob Handley in Utah and with UFC veterans Josh Burkman and Steven Siler, too. Williams said he’s usually in the gym three to four times per week in the offseason. When his NBA career is over, Williams said he’d love to compete in jiu-jitsu competitions. He is, after all, a former wrestling youth state champion in Texas. Right now, Williams has plenty on his plate. The 12-year NBA veteran is the backup point guard for the Cavaliers, who are currently in the NBA Eastern Conference finals. Williams is a three-time NBA All-Star and two-time Olympic gold medalist. Still, if a basketball game comes on at the same time as an MMA fight, Williams will choose MMA every time. He said he watches every UFC card, from Fight Pass prelims to the main event. Williams calls his favorite fighter Jon Jones, but since he has been inactive Demetrious Johnson is Williams’ second choice. “Jon Jones was my favorite fighter,” Williams said. “He hasn’t fought in two years, it’s hard to say somebody that’s not out there. But I love watching Mighty Mouse. He’s amazing. He’s just so technical. He’s great standup, wrestling, he’s slick on his back. He can do it all. Williams, 32, is definitely a student of MMA. And he’s got a stake in it now, too. He’s not sure if there will ever be a union like NBA players have, but he’ll surely be keeping a close eye on the developments. Bia Mesquita is one of the best grapplers in the world today, and could be the next jiu-jitsu star to make her transition to mixed martial arts. Winner of seven IBJJF world titles, three as a black belt, Mesquita, who competes around 140 pounds in jiu-jitsu, stole the show Saturday night in Rio de Janeiro, submitting rising MMA prospect — and fellow grappling ace — Mackenzie Dern at the Rio Falls absolute final. “I thought the match would be a bit tougher,” Mesquita, who faced Dern for the first time in a jiu-jitsu match, told MMA Fighting after winning the match in just 64 seconds. “I was surprised how fast it was. I thought it would be closer. I believed in the win, but I thought it would be closer, that I would win by two points or an advantage, that it would last 10 minutes. After winning the weight and absolute gold medals in Rio, Mesquita will now compete at the Abu Dhabi World Pro trials, Brazilian National, San Diego Open and then the World Championship in the next two months. Going for her eight world title in Long Beach in June, Mesquita plans to shift her focus right after. The Saquarema native, who turns 26 years old on April 7, has already conquered every title possible in the jiu-jitsu world, and trained with MMA stars like Urijah Faber and Jessica Penne in the past has changed the way she sees the sport. Mesquita says she has trained muay thai before, but only lightly. The Nevada Athletic Commission handed Conor McGregor a reduced punishment for the infamous UFC 202 pre-fight press conference bottle-throwing melee, and now it wants to look into doing the same for Nate Diaz. UFC heavyweight Justin Ledet has been notified of a potential anti-doping violation, according to a statement released by the promotion on Wednesday.